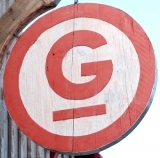 The Gravel Bar and Grill is Ennis' premier destination for good times. The bar and grill are open year round serving delicious Montana pub fare alongside a full bar featuring Montana microbrews and custom cocktails. In addition to great food and drinks, the Gravel Bar features live music throughout the year with both local and national acts gracing our stage. We also have the facilities to host private parties, whenever the need may arise. Once Memorial Day hits, the action around the G bar really picks up. Banditos, The Scoop Shack and our rental cabins all open for the season. Banditos, our flagship restaurant, has been serving some of Montana's finest Southwestern cuisine for over a decade. The Scoop Shack offers Montana made Wilcoxsons ice cream outside on our lawn. Our four rental cabins, located behind our building, are perfect little private cabins for an escape in Ennis. Next time you're in Ennis stop by. The Gravel bar has a little something for everyone.